In a 5-quart slow cooker, combine the tomatoes, broth and tomato paste. Stir in the green peppers, onion, celery, garlic and seasonings. 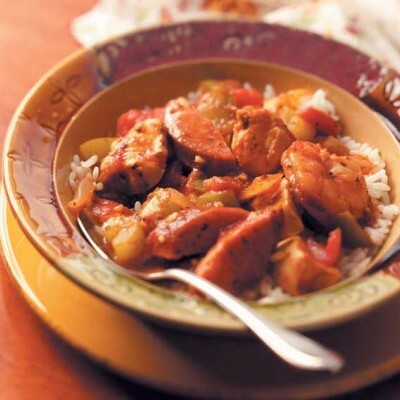 Stir in chicken and sausage. Cover and cook on low for 4–6 hours or until chicken is no longer pink. Stir in shrimp. Cover and cook 15–30 minutes longer or until shrimp turn pink. Serve with rice.